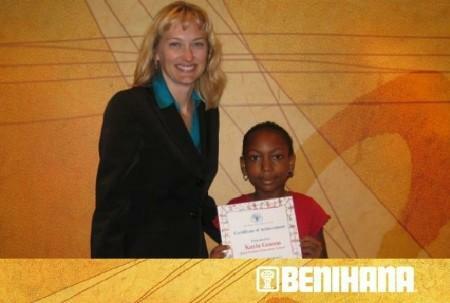 Benihana Restaurant in City of Industry hosted the 10th annual Lunch with the Principal event on Tuesday. Walnut Valley is among a select group of school districts that partners with the Japanese restaurant for this special recognition ceremony. Each of our elementary schools selects a student to be honored for improvement in academics, or citizenship, or for making a difference on their campus. After enjoying a sizzling teppan-style lunch prepared by a personal chef, the fifth graders were introduced by their principals who shared their personal stories. Several had gone through difficult health concerns or family issues, yet they are making the best of their situation. The Lunch with the Principal event provides an opportunity to recognize these youngsters for their determination and perseverance and to applaud it. Each honoree received a certificate of achievement and gift, and posed for a keepsake pictures with their principal.